The game counters/tokens are well worth your support. I’m probably going to double the price after the Kickstarter ends. Hand finished game tokens are really, really, really rare in our world of factory made goods. I had priced them to compete with factory made goods, but maybe that’s the wrong approach. 35 more days to go! Get them at the lower price while you can! 36 days to go and the Lore Bits Kickstarter has cracked 10% funding and has 7 supporters. I’m not sure it’s going to fully fund. But I’ve been assured that the last 48 hours of a kickstarter may see an increase in sponsors. I get plenty of orders from other places besides kickstarter, so it’s all good. However, they were specifically designed for Kickstarter and it’s game playing peeps. So this is dissappointing. I haven’t given up on it though. Here’s hoping for more positive news about the Kickstarter. 40 Days Until the Lore Bits Kickstarter finishes. Here’s the short link, in case you can’t find the other 20,000 places that I’ve posted it. A part of me wonders if I should be promoting my own website as much as I’m posting the Kickstarter link. Would this energy be better served if I posted my own links 20 times a day? What about 40 links a day? I’m working on this day and night. Answering questions on Kickstarter, posting new rewards, and generally being on high alert every moment of every day. Forty more days? Yeeks! It is not fully funded yet. Not even 10% funded yet. Should I have made it for a $100 and not $2000? What will happen if it doesn’t get funded? Lore Bits are a great product. It’s a matter of getting them in to the right hands. It would be great if there was a magic wand that would help it get noticed. There is no magic wand, of course. The Oatmeal’s kickstarter was fantasically successful just a few weeks ago. The Pebble watch thingy was even more successful. Maybe I’m on the wrong crowdfunding site if all Kickstarter is interested in is large projects that generate a lot of fees for them. Oh. Dear. That might be the problem. I’ve still been contacted by more marketers than potential purchasers. Growth Hacking is apparently the latest marketing buzzword. Too bad. I rather liked SEO expert. It had the word expert modified by SEO. Which is fancy speak for someone who knows how to manipulate Google’s algorythim. If you do see this post, go check out the kickstarter. If you see this post after the kickstarter ends (April 22nd, 2015) , make sure you check out the shop on this website. 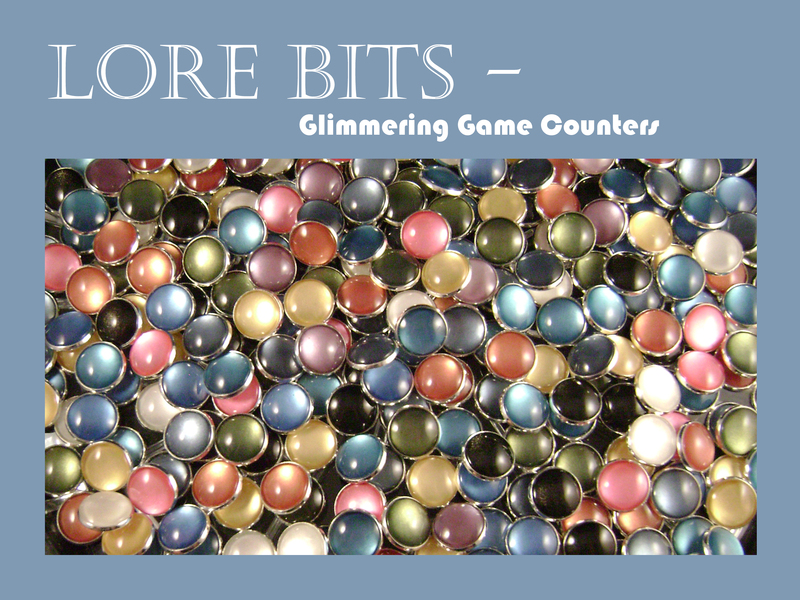 You can buy the Lore Bits at a reasonable price, support a small business and get some super shiny game tokens! Note: Please send more comments about how many hits I’m missing out on google, search engines, and everything else. It’s good to know that I’m missing out on 300 unique visitors a day. In our consumer driven society, it can be so much easier to order some factory made goods. They look the same, they smell the same and let’s face it, they are usually consistent in quality. All of which lend itself to the McDonaldaztion of America. Sometimes there is a place for mass produced good. Why not save a place in your house for hand crafted goods? Pottery is one thing that comes to mind. Plenty of potters around who sell their goods at weekend fairs. What about toys? Crave something other than plastic? You might be luck, plenty of crafters make cloth dolls, toys, and wooden blocks. Does it seem more expensive? Sure. But they aren’t mass producing their goods. They are handcrafted, paying taxes here, and often are of great quality. And you get to support a small workshop. Tucked into corners around any large city, they preserve the old crafts. One of my great loves is making paper. Unfortunately, my Seattle soggy climate does not lend itself to producing large quantities of paper. It’s nice making it for my personal use though! All that fussing around with crafts has made create afghan’s, pillows, crocheting and now Lore Bits and their fridge magnet cousins. I hope you will find them an excellent addition to your home and game table. Do you hand craft something that could be ordered from a giant factory? Send a picture and description, I might feature it on this blog! Note: My humble game counters have been rejected by www.boardgamegeek.com because they aren’t for a specific game. Then they rejected my company, because the game counters were rejected. I’m sure they have a specific rule in place that supports that. It’s an extremely large website, that I had hoped would provide a tad bit of traffic for the Kickstarter. But alas, it is not to be. One more mountain that I need to overcome. No wonder so many people create their own game review blogs. I didn’t even know they had that rule. In addition, they have an old school thread system that I hadn’t seen in over 10 years. I’m sure it would be a nightmare to migrate everything. My suggestion? They should check out BuddyPress for a solution. Good thing that many more places are welcoming to upstarts like me! I’m so excited! We’ve been working hard to perfect the Lore Bits! They are perfect for Game Money, Tokens, or Hoarding. How could you resist supporting them on KickStarter? Note: 3/10/15. Okay, so the kickstarter campaign hasn’t gotten off to the best start. I’ve actually gotten more marketing companies contacting me instead of subscribers. As of yet, not one seems to have read the campaign. I’ll let you know when I get at least one that knows what Lore Bits are. Kickstarter seems to have buried the campaign. I even have problems finding it unless using a direct link. While projects like exploding kittens get lots of love, not so much independents who make great products. The only solution that I’ve heard for that problem is buy lots and lots of advertising. That would push up the price of the products. In addition, it seems to go against the spirit of kickstarter, which is to fund independent projects. It runs until April 22nd, 2015. If it’s not successful, I still have faith in my Lore Bits. They will make a great addon product at game stores. Something by the register for people to buy. Etsy filed to be a public company today. I guess that explains why a small store like mine gets ignored. Oh, but I can promote my goods. Just pay a tiny fee. Looks like there have been a lot people doing that from the looks of their S-1 statement that they filed. I wish them the best of luck. But if they are in search of someone to pay their filing fees and all that fine stuff, I’m out of there. Not that they would notice. I’m sure Paper Butterfly Forge isn’t on their radar. I’ve helped prepare filings for public companies before and worked with auditors before. I know it isn’t cheap. Never mind the millions of sellers they have. What are their sales? I’m willing to bet the listing fees exceed the total sales. A recent ABC news article said over 65% of the sellers make less than a hundred dollars a year on etsy. I can’t say I was surprised. It’s clear that some of the products on sale there are made in a factory. Too many available, too perfect, photoshopped and completely not hand made by artisans. The last time I checked the glass dome there were over 36,000 results. I’ve seen products listed that were labeled with Daiso labels. (Japanese Walmart) I’ve seen supposedly all hand made products with over 200,000 sales by one person. Earlier this winter, they changed the rules, so you could hire workshops or FACTORIES to produce your products. You only had to design your product. Yah, that’s a factory folks. I guess that the end of the day, I don’t want to pay for some finance whiz’s yacht. I’d rather buy my own yacht. Lore Bits are almost ready to Launch! Hey guys, we are getting ready to launch a kickstarter campaign for Lore Bits. What are Lore Bits? Totally awesome game tokens that are made from tint, glass & actual metal. Notice there is no cardboard and no printing. How do they look? So far we have about eight colors and are researching and experimenting with tint. If you have a suggestion, let us know. I was trying to find out how many shops were on etsy. I found a search box for shops. When the search box was empty, it showed over six million users. I’m not sure if that includes purchasers or if it’s just shops. But it certainly explains why it’s so difficult to be found on etsy. You do need an outside sales funnel pointed at etsy for it to be really effective. One of the webinars that I attended for etsy; suggested that you should have at least 200 products listed. Unless you are doing one of kinds, that would be difficult for most people to stock. It’s time and materials invested into a hope and a dream. Lore Bits are shiny new game tokens. I make them, check them and then recheck them to make sure they are perfect for game night. I’m probably going to sell them at least 20 to a package. Many games have poorly printed and punched out game tokens. Upgrade your game to feature some shiny Lore Bits! I’m getting some other colors lined up and hope to have a full line of shimmering glass objects. They will also be available without the magnets…. Perhaps called Lore Bits? Game counters and money galore. Still working out the deets on those. Should I just make them a plain gold, silver or copper? Or should they have a denomination. Either way it should be fun! I have a few different interests and hobbies. I apologize for intersection of madness and creativity that pops up here. The shop is a mishmash of products that I make. Some virtual, some irl, or rpg. I’ve been told you really need to have specific shops on ebay and other places to sell stuff. I can’t handle that. I’m not an insect. I don’t specialize. I write for part of the day. I create for part of the day. And I design for part of the day. Please visit my mad shop from time to time. Don’t hold it against me if there are CPA spreadsheets right next to a BOO! Halloween sign that I made last Halloween. I’ve redone and redone this website. First it was a writing blog. Then it was dead. Then I found out I could still get the url. I revived the zombie site. Then it did crafts. Then it did role playing game stuff. Now, it’s my basement of whatever survived the flood of my imagination. Halloween parties were always the best when I was a kid. We didn’t have to be proper. We didn’t have to look nice. And, Best of All: Free Candy! Set an ending and a start time. Many people visit a number of places on Halloween day or weekend. Let them know the specific time. Make activities age appropriate. Teenagers may not be fully engaged if they have to do a coloring contest. Serve a buffet instead of a meal. This will allow picky eaters to choose. Invitations should state whether there will be candy or a meal served. Reserve Dry Ice in advance. Make sure the dry ice you order is food grade. You will need to handle with tongs or rubber gloves. A punchbowl filled with punch, 7-up, ice cream, and dry ice can be a whizbang addition to your halloween party.